The WDHS Education Centre offers the perfect environment for any meeting, conference, function or social event. Our state of the art Centre offers a suite of venues catering for a range of purposes including lectures, presentations, meetings and conferences. There is a fully-appointed 106 seat auditorium, two seminar rooms that can be used as separate spaces or opened up to create one large space, a small meeting room and a foyer ideal for registration, tea breaks and meals. Our corporate boardroom is a purpose built room with a set boardroom table to accommodate 14 people. The boardroom has video conference facilities and a digital whiteboard, perfect for board meetings and discussion groups. Our computer training room is equipped with 5 PC's and is fully networked with printer and internet access. Data projector and whiteboard are available upon request. The clinical skills laboratory is well equipped to teach a variety of skills and procedures. The lab is setup as a small classroom at one end with tables and chairs to sit up to eight students comfortably and has white board and x-ray viewer. The other end of the room is setup with bed, trolleys and equipment to simulate the clinical environment. A range of manikins and clinical equipment are available for use. 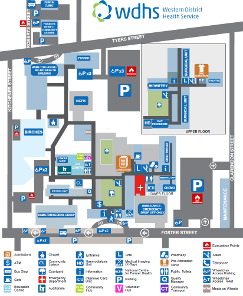 The Centre has its own carpark off Kitchener Street, along with designated sites for the disabled. Automatic doors open directly off the carpark. The disabled are well catered for with wheelchair access and toilet facilities. The first four rows of the auditorium have a 'hearing loop' for the hearing impaired. Our auditorium has touch-screen technology which allows for the use of PC's, data and slide projectors, TV, VCR, CDs, cassettes and radio. Presentations in the auditorium can be simultaneously viewed in both seminar rooms and recorded. The sound and lighting are all operated by the same touch screen and, along with the acoustics, are excellent. We also have data projects, tele conferencing and video conferencing equipment that can be used throughout the centre. A range of excellent catering can be arranged at a reasonable cost by the Education Centre Administrator through the WDHS Hotel Services Department. Direct consultation with our chef is also possible upon request. All room hire is inclusive of equipment and tea, coffee and biscuits.